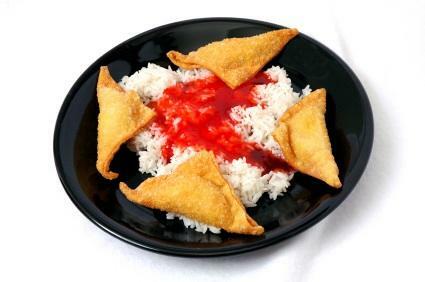 Crab cheese wontons (also known as crab Rangoon or crab purses) are a perennial favorite as an appetizer in many Asian restaurants. Made with a crispy wonton surrounding a rich, savory, and creamy mixture of cream cheese, crab and scallions; crab cheese wontons are a delicious and elegant start to any meal. Why not serve this appetizer at your next gathering? As far as recipes go, crab cheese wontons contain a number of fairly simple ingredients, most of which are as near as your local grocery store. These appetizers are made up of wonton wrappers wrapped around a filling of crab, cream cheese, minced scallions and a little bit of flour. The whole thing is then wrapped up, brushed with a little beaten egg to seal the wrappers, and then deep fried. The crisp outside is made from wonton wrappers, which can be found on the Internet, at some grocery stores, at specialty grocers and at Asian markets. There are a number of online retailers that sell wonton wrappers. If you can't find them locally and don't want to wait for shipping from an Internet order, you can make your own wonton wrappers. To make your own wonton wrappers, use the following simple recipe. Beat the egg and the salt together, and then beat in 1/4 cup of the water. Make a well in the center of the flour and add the egg/salt/water mixture to it. Continue stirring and add only as much water as you need to make a ball of dough. Knead the dough until it is springy - about five minutes. Cover the dough and allow it to rest for 30 minutes. Lightly flour a work surface and roll out the dough until it is extremely thin. Cut the dough into three to four inch squares. Store the dough tightly sealed until you are ready to work with it. The dough can be kept for up to six months in the freezer. Crab and cheese wontons are made using a deep fryer. You may use either a deep pot on the stove or a deep fryer. Be sure to use oil that has been heated to 350 degrees with enough oil to sufficiently cover everything you are frying. Combine the scallions, cream cheese, crab and flour in a small bowl. Place heaping tablespoons of the crab mixture onto each wonton wrapper. Brush the edges of the wrapper with the beaten egg. Fold the wrappers crosswise to form a triangle and press the edges together to seal. Fold the triangle edge to edge to form a ring and seal. Fry the wontons until golden, about 2-3 minutes. Turn once during the frying. Don't overcrowd the fryer, or the temperature of your oil will drop. Instead, fry the wontons in batches, allowing the oil to reach 350 degrees between each batch. Remove the wontons with a slotted spoon and drain them on paper towls. Wontons can also be filled with cream-cheese based seafood spreads. In the recipe above, crab can be replaced with shrimp, lobster or some other shellfish that you enjoy. You may also use imitation crab, which is made from white fish, but has the characteristic sweetness of crab meat. If you want to make crab Rangoon but lack the time, necessary materials or skill, then you can buy it ready to go. Many Chinese restaurants will be happy to make them and allow you to pick them up just before your party. They can be kept warm in a 200 degree oven until it is time to serve them. These appetizers are also available in the freezer section of some grocery stores, such as Trader Joe's.